I’ve tried so many ways to teach literary terms. I’m up for anything that doesn’t involve me standing in front of the room dictating the definitions to a room of unengaged students. Some of the ideas worked and others not so much. Thankfully, we finally found a winner! 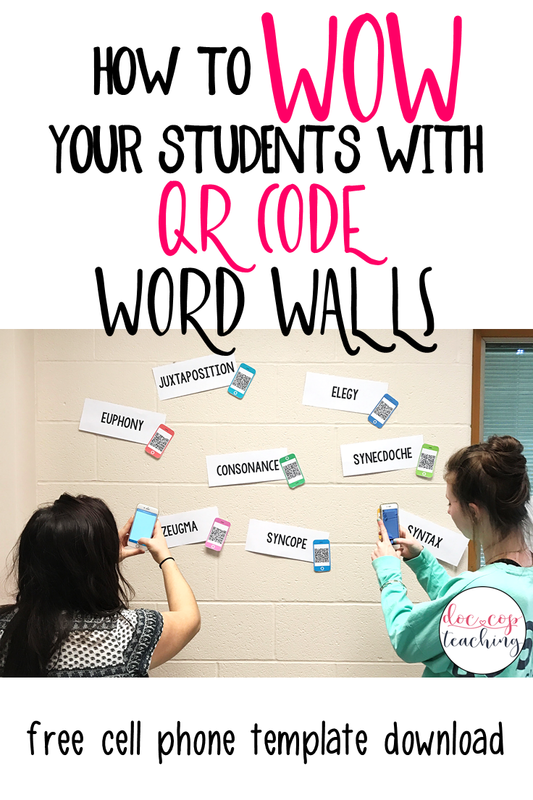 Our QR Code Word Wall is a definite keeper! It’s versatile. Word walls, in general, build familiarity with important words. Weekly vocabulary words, SAT prep vocab, and literary terms are just a few of the many content-driven applications. It’s collaborative. Students are a part of the word wall creation, so they take ownership of the words. It’s fun. We set up a “filming corner,” and they go to work adding their own flair. Because each QR Code corresponds to a video of an explanation of the word by one of my students, they find it fun to watch the videos of their classmates. I like it because it’s a great way to infuse multiple voices into the classroom aside from the teacher. It’s decorative. They look great! It can be a bit challenging to spice up the classroom in older grades yet maintain a more sophisticated look. We love the way our word wall looks! It’s effective. The wall can be added to throughout the year, and we can reference it whenever we need to. I also noticed that students associated each word with the person who explained the term, and therefore, they were able to retain the information longer and more accurately. It’s easy. Keep reading and I’ll show you how! 1) First decide on your list. I created simple black and white printouts using cardstock. For my example, we used challenging AP literary terms. I love that my students can be involved in creating the list. My students use this TALK guide to annotate their texts. The “K” stands for “Key in” and asks them to key in on important literary terms. We use this guide to find and reiterate our literary terms. I also like involving students on the selection of our words. I use Bookmark Vocabulary for student-led contextual vocabulary study. Be able to pronounce your word correctly. They can look the word up on dictionary.com or YouTube for the pronunciation. Be able to tell me the definition. Be able to give me an example. I gave this short assignment as homework. I also didn’t reveal what we were doing with it until the next day…sneak attack! 3) Set up a filming space. I used an old roll of dark blue wrapping paper for our backdrop. I simply taped it to the wall, and set up my podium across it to hold our iPad. I used my school-issued iPad for the taping, but you could also use a SmartPhone. Follow me on Instagram @doc_cop for more teaching tidbits. 4) Film the students. I sent my students out in the hall in groups of three to do their own filming. We easily got through 16 students in one 40-minute class period. The rest of the class was working on another assignment. 5) If you don’t have it on your device already, download Google Drive, Dropbox, OneDrive, or another cloud. Save all of your videos to that cloud. 6) Access the videos from your cloud on your computer and copy the shareable link. 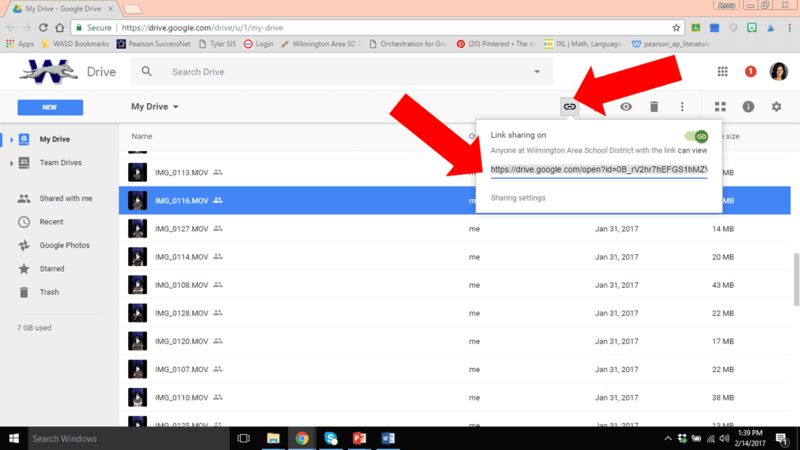 I like to use Google Drive because our school issues Google email addresses to the students. This makes it possible for the links to only be viewable to members of our district. 7) Next, paste each shared URL into a QR Code generator, and save the QR code. There are so many options, but I like this one. 8) I made colorful cell phone clip art to display our QR codes with their matching words. You can get template free below. 9) I found some packaging tape, and I taped these terms on three different spots around my room. 10) As the culminating activity, my students walked around the room with their cell phones or one of our school-issued iPads and scanned the QR codes. They recorded the definitions and examples in their notes. My students really loved creating this word wall, and they asked if we could continue to add words throughout the year. When you hear a high schooler say, “This is so cool!” you know it’s a keeper! This is a great idea! I teach English in Japan and will defiantly try it. Thanks for posting. OMG! This is so amazing! I'll be using this with my boy and I'm sure he'll love it! The free cell phone template only brings up the three photos within this page. Is there something that I am missing? Did you get a reply? I need this today, and the same thing happened with me. Thanks for this post. I also encourage you to have a look at this valuable information on research paper writing. I can’t get the free cell phone template. Is it available on TPT?